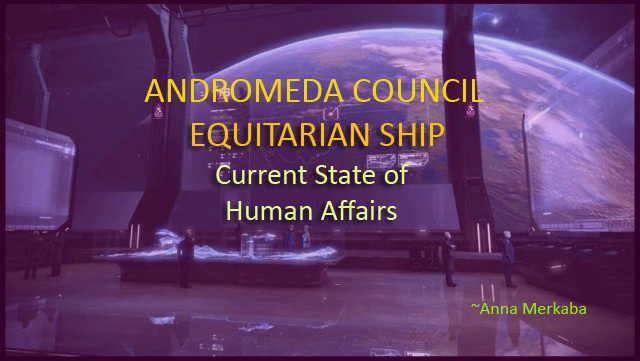 The Andromeda council welcomes you aboard the Equitarian ship. The Equitarian ship. For indeed the life giving energies of the life force currently in play on planet earth have given rise to the subterranean cultures to ascend from the east to the west, from the north to the south. And so, as we begin the following discussion of the present affairs of the human culture and genome, let us begin to revive the informational decree currently in procession into the human vehicle known collectively as humanity. For in essence all that exists in the human understanding of things is within the core of their sub atomic particles and structure. The energies that are presently being collected and exchanged from within the core of each earthling dwelling therein is to be reproduced and stored for future generations to study and determine the causes and learn from the history of in order to avoid that which has occurred in the present reality of earthlings. And so and thus, the energy that is being generated from the conclaves of society, from the conclaves of the etheric realms and the conclaves from Agartha is traveling rapidly through the body of earth and all the species dwelling therein. For each and every living and non living but, conscious being residing on planet earth is currently receiving the upgrades and is currently finding themselves in the turmoil of the new energies blasting the planet with love, support and understanding. Nonetheless, for these new energies to be integrated fully and completely into the society in which many are finding themselves to be, the light workers, the ground crew, must fully and completely release all that stands in their way of receiving the utmost brilliant informational decrees. And by that we mean releasing and letting go of the old patterns of thinking, the old paradigms, working with your shadow self and embracing all that you are. For in essence there is no duality, for all exists simultaneously so, for one cannot exist without the other, but ALL MUST BE HELD IN PERSPECTIVE AND BALANCE. Let it be known that the animal kingdom is going through the exact same allocation of powers and allocations of consciousness. And hence those of you dwelling on GAIA have indeed noticed the expansion of consciousness and the sudden change in the behavioral modalities of the animal kingdom. For the animal kingdom is expanding their consciousness as we speak. For in order for humanity to integrate all that it is to integrate into the newly built society each and every individual must understand that the experience of GAIA’s ascension involves every single conscious being dwelling therein. And so to assist GAIA in fully raising her vibrations to such a high degree that most are awaiting, humanity must embrace and understand that indeed they are not the only ones who are capable of understanding the universal laws of creation, manifestation and abundance. For the integration of newly distributed energies must occur on all planes, physical, emotional, spiritual, and material. And each and every cell of each organism dwelling on Gaia is to be prepared for even more, of what is to come. Therefore, it is of utmost importance for all of you to comprehend that ascension occurs in stages, for there must be various stages, for the human vehicle is capable of handling only so much energy and should the ascension energies be amplified infinitely, all the earthly vehicles would cease to exist! As many of you are beginning to see us on a daily basis, as many of you are beginning to feel the upliftement of energies and the changing of time lines, you are beginning to understand and expand your cores and visions even further still. You are beginning to embrace the new energies and are opening the doorway for even more gradual informational decree to flourish on planet earth. Each and every single one of you light workers, star seeds, star people collectively known as the ground crew, are stationed on Gaia at specific locations,. Locations which intertwine via lay lines, and other energy gateways. Each one of you is connected to the other, in the web of light and love. Each one is stationed specifically at various points in order to continue the effort of informational decrees that you have come here to institute. And hence, those of you who are feeling the irrevocable desire to change locations of your residences, to move into other territories, should follow the guidance, for all of this is being done in order to further anchor the new energies. Please understand our dearly beloved brothers and sisters of light, that the transformation that Gaia is presently going through and that each human soul is going through, cannot possibly be achieve overnight in your understanding of time and space. And so, the political arena of your world is changing rapidly. You are seeing more and more wars springing up, and revolutions taking place. All of this is simply EGO’s at play, for the EGO of each individual involved in the political arena of your earth is trying desperately to hold on to power. And yet, it is not to be, for this reign will not last long. For it is no longer possible to work through the ego self, for the ego self of every single human being dwelling on Gaia must come into alignment with the higher self of the each being, for from the moment of now the higher self is taking control of the situation, and the conflict that is arising must be resolved first and foremost from the internal aspect of self. Once the conflict has been resolved and the energies balanced internally it shall then be possible to expand said consciousness further still and out into the universe enlarge. That is why and hence in each of the messages that we send to all of you through your various beloved channels, we ask that you clean your slate, that you release and let go of that which no longer serves you, for in order for you to integrate the new energies you must have the room in your consciousness to expand and the room in your consciousness to allow the expansion to continue. The DNA structure of many of you has already been changed, and yet the layers which you have accumulated over the years of being encapsulated into the belief systems of the world that you have found yourselves to be in, are playing a major role in providing a playground for magnificent understanding and reevaluation of your belief structures to take place, allowing you to clean your slate in order to connect to your higher selves. And so each layer that you release will bring you closer and closer the true higher consciousness of your being. The higher consciousness of that which you are, and you shall then be able to open the door to the real mission at hand. To understand the direct steps that you are to follow in order to take your righteous place in the universe. Many more portals await you dearly beloved ones, needless to say we ask that you not wait for any portals to open in order to cleanse your slate, in fact we ask that you do so before the portals, as when the portal does indeed open there shall be room in your heart and in your body for more informational decrees to flow throughout your system and readjust and realign you with your soul purpose, with that which you are and bring you closer to the understanding of life. Be well dearly beloved ones, understand that you are all here to BE , and to experience Being in the moment of time, whilst being fully and completely connected to the divinity within your own selves. Know that we are standing by you ready to assist you in all that you are, ready to lend you a helping hand. Know that you are powerful indeed, that you walk the earthly planes of existence with the diminished understanding of your powers, and with each moment of your expansion of consciousness, you are being brought closer and closer to your your true identity and to your true powers of manifestation. We leave you now with the final word, “allow your mind, your heart to open the gateway to the truth and understanding of that which you are, of the universal slaws of creation, of the universal laws of love and soon you will find yourself fully awakened, fully equipped to align humanity with the eternal truth of the creator. One is unable to hide anything from the feline race they can scan and see energy clearly,,,,if you had been unbalanced those visitations dont happen,,,great sign your energy is high ,clear ,,being happy everything comes to us. Thanks Again, Anna. I live with parrots and have noticed a new independence.Namaste. Thank you Anna! I always appreciate your updates and resonate with them! I have noticed the change in the animals that I encounter! Yes the animals, thank you. I had a long conversation with a squirrel yesterday, I could feel our physical connection, and he just laid down with me and had a chat. I could feel the whole forest speaking to me yesterday, and the wind had so many replies for me. I appreciate your posts sooo much, they are great sign posts for the road we are walking / becoming. Much love. For the past few months, the main message I have been receiving is to “LET GO!” It’s everywhere and still I am having trouble fully letting go but I did find a simple technique that I am now using to destroy false beliefs. Follow the emotion, the stronger the belief, the stronger the emotion will be. Can you share this technique Cassandra because I need some help with the really embedded stuff that is hard to shift. Beware of SHIPS coming to take you away. This is false, ASCENSION is NOT about leaving the planet. The HUMAN PLAN is to bring the WHOLE SOUL back into the body and physical realm that is Earth. We will create again our heaven on Earth and we are Late… we should have completed this in 2012 but RACE consciousness and thousands of years of programming has stymied the HUMAN PLAN. It is not about some ET being that is to guide us… Listen and talk to YOUR higher self, your Over Soul. Just ask and you will be guided to your answers. While channels give good ideas and are positive the answers are within YOU. GOOGLE Chris Thomas Healer – Listen to his ideas, very useful. This page has only 2 mentions of the word Soul. Infected with RUSH OF ANDROMEDA! Yes! I felt like my circuits were going to get blown off and then just fly off into stratosphere!!! Reblogged this on spring solstice.